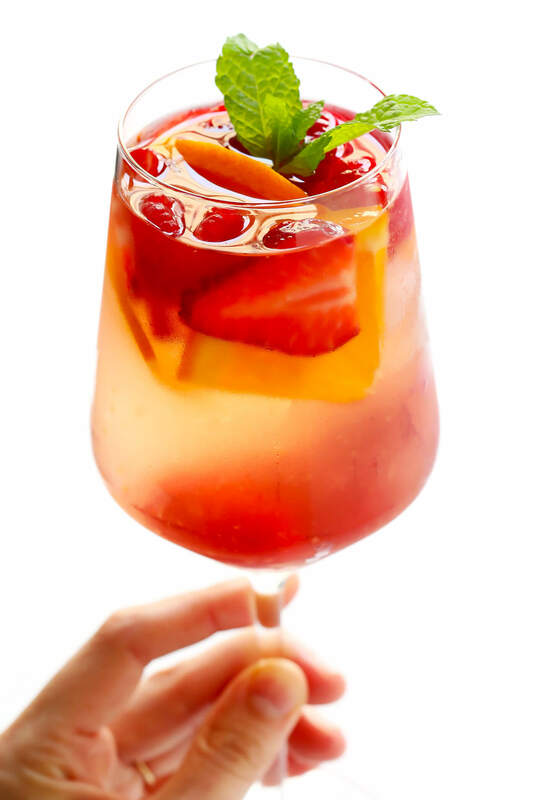 This lovely rosé sangria is made with your choice of fresh fruit, crisp rosé wine, and a subtle splash of rose water. It’s the perfect refreshing drink for spring and summertime! Love springtime roses and rosé? I’ve brought the two together for you today in this lovely new sangria recipe! Which yes, if it’s new to you, is made from steeping actual rose petals in water. It adds the most delightful floral notes to any sangria, but pairs especially well with this rosé. (And also doubles as a lovely natural toner for your skin!) And together, all of the ingredients in this rosy rosé sangria come together beautifully. Perfect for brunches, packed up in mason jars for picnics, last-minute happy hours on the patio, warm summer dinner parties…you name it. 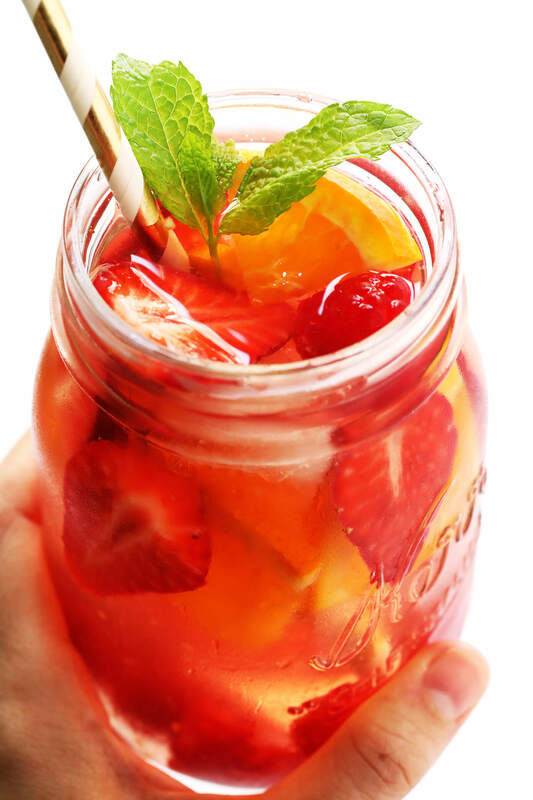 This sangria tastes like summer in a glass, and I think you are going to love it. As I mentioned, rose water (affiliate link) has actually been one of my favorite natural toners for years and years. But it is also a traditional ingredient in Middle Eastern cooking, and it is delicious. I’ve loved adding a hint to my lemonade, cakes, fruit crisps, and even occasional savory dishes for years. But I must say, rose water is especially lovely in this fruity rosé sangria. You can either pick up a bottle for yourself at your local Middle Eastern market (it usually only costs $1-2 in person), order some on Amazon (slightly more expensive), or if you can’t find a bottle, just muddle a few organic rose petals straight into your sangria. A little rose water does go a long way, so I recommend just starting with a tablespoon or so, and then adding a touch more to taste. 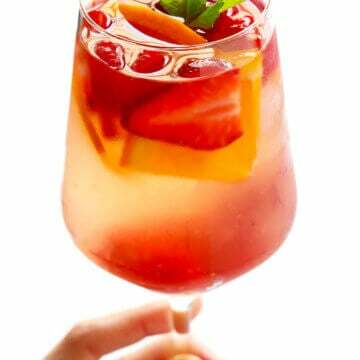 Rosé wine: The best rosé wine to use in this sangria recipe will be one that is nice and crisp and dry. The berries will naturally lend a ton of sweetness to the sangria, so I recommend starting with a wine that is not too sweet. And — as always with sangria — no need to splurge on fancy wine. Some inexpensive bottles will be great! Berries: I used a mix of fresh strawberries and raspberries. 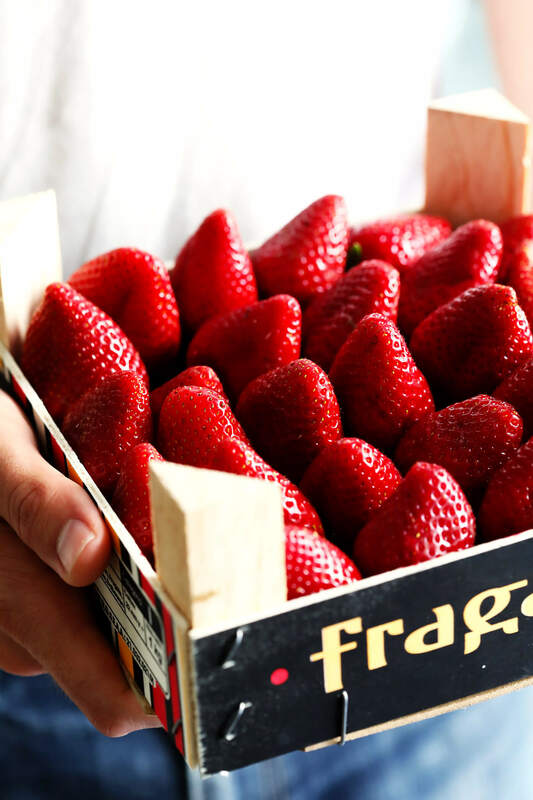 (See this gorgeous box of berries we brought home from the market yesterday above. ♡) But really, any kind of berries or juicy fruits — such as blackberries, blueberries, peaches, plums, etc. — would be delicious in this recipe. 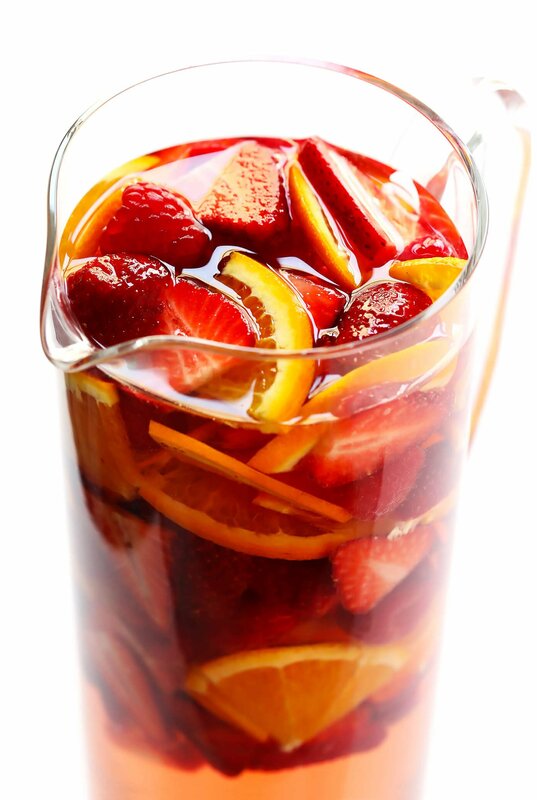 Citrus: A hint of orange, lemon or lime help to brighten the flavor of this sangria, and add an extra colorful touch. 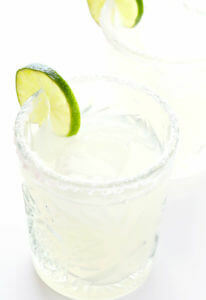 Sparkling water: If you’d like to add a few bubbles to your sangria, a cup of any kind of sparkling water will be great. 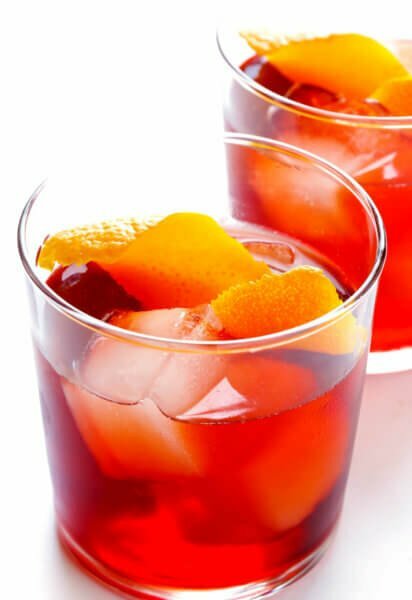 (Optional) Extra liqueur: It’s traditional to add a little extra liqueur to sangria, but you’re welcome to skip this step if you’d like. I made my sangria with St. Germain elderflower liqueur, and it was fantastic. But brandy or orange liqueur would also be delicious. 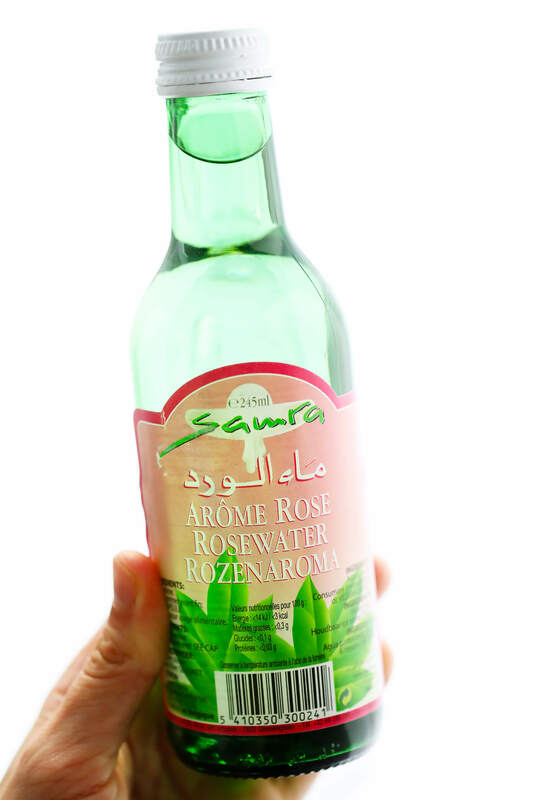 Rose water: And of course…rose water. 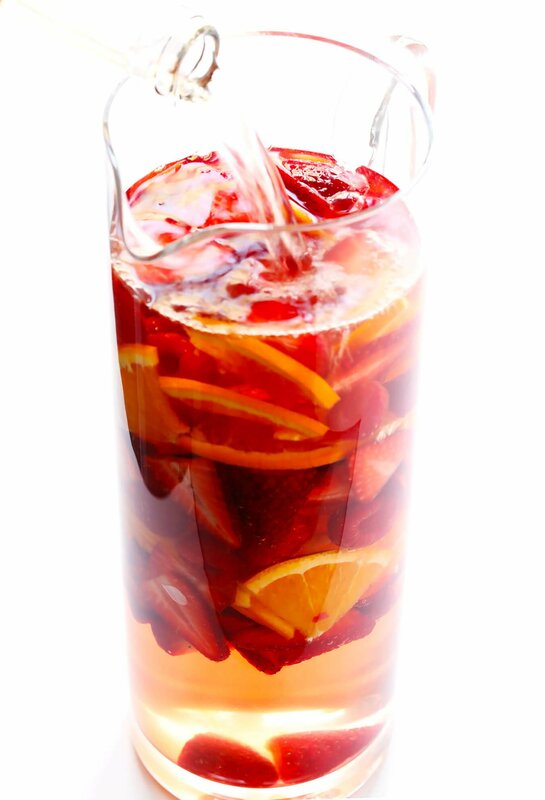 To make sangria, simply stir all of your ingredients together in a large pitcher (being sure to add the rose water in slowly at the end, to taste). 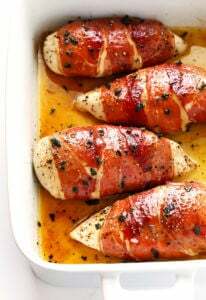 Cover and refrigerate for at least 2-ish hours, or up to 12 hours. 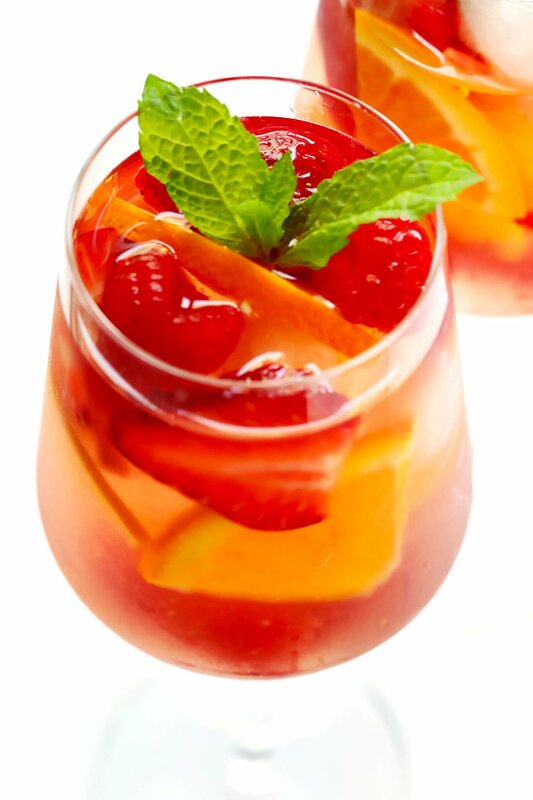 Then pour over ice in individual, maybe adding in a little extra fresh fruit and a garnish of mint, and…serve! So easy! Use sparkling rosé wine: for an extra bubbly sangria. Make a sangria slushie: using frozen instead of fresh fruit, then blending until smooth. Float a fresh rose petal or two in each serving glass: for a lovely floral presentation. Combine all of the ingredients together in a large pitcher and stir to combine. Cover and refrigerate for 2-12 hours before serving. Prep time listed only includes the active prep time. I recommend letting the sangria refrigerate for at least 2 hours before serving for maximum flavor. I’m worried about adding sparkling water or sparkling rosé early and having it go flat. How early have you added it and still been able to have it be bubbly? This recipe looks so pretty! Lovely Sangría Ali. My daughter makes her own rose water from my rose petals for her ice cream. My own sangía recipe from my mother’s – dry red wine (Argentinian is the driest i know but often use Chianti for this version), mulled apples, grapes, sectioned orange chunks – not too much of this, a splash of OJ, a few squirts lemon juice, and Vodka (about 1/3 the amount of wine in V). Stir, refrigerate – pour over a few ice cubes and spoon some fruit in each one. Look up Sangría Carajo in Puerto Rico – they won’t share their recipe but this one came close. Loving your recipes from Barcelona. Yuuuummmmmmmm!!!!! Perfect for a date night or brunch! a very nice sangria, had not ever gone into any depth on rose water so good to know, thank you for this recipe!